Ah, Tiddly Winks (also known as Tiddledy Winks and Tiddlywinks)...such a cute name for an old favourite. In its simplest form this is an easy game for children and best played on the floor on a flat surface, as it involves flying objects...basically the idea is to flick your winks (discs) into a cup using a squidger - a tool for pressing down on one side of the wink. The one who gets the most winks into a cup wins. 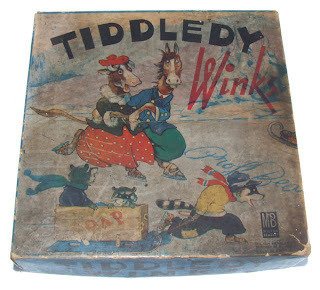 At the height of its popularity in the Victorian era 1890s, Tiddly Winks was a popular craze for adults and in the 1950s a more complex version was played with enthusiasm by Cambridge undergraduates, leading to a new set of competitive rules. For an insight into the history of the game, check out The North American Tiddlywinks Association's article here. In this version the game is played on a 6 ft by 3 ft mat placed on a table with a pot in the centre, with four players positioned at each corner. Players are divided into pairs, with each player controlling a colour - blue, red, green and yellow. Traditionally red and blue are opposite green and yellow. The object of the game is get as many of your own colours into the pot as possible, while preventing your opponents from doing the same. By flicking a wink on to an opponents colour, (called squopping), they can be prevented them from landing one of their own colours in the pot. However another colour may be flicked on top of that colour and so on, often resulting in a pile of winks of various colours. All players take turns to flick and if a wink of the right colour is landed in the pot, that player gets another shot. If not, play moves to the next player. The game ends when all one colour is in the pot. The adult game of Tiddlywinks involves some serious skill, both physically and strategy-wise and is taken very seriously indeed and there are National associations and tournaments in the US and Britain. More comprehensive rules and all the intricacies of the game can be found on the English Tiddlywinks Association website.